You'll need a ripe banana, one teaspoon of unsalted peanut butter and one cup plain non-fat yogurt (not sweetened or flavoured). Combine the ingredients in a blender and pour into an ice cube mould. 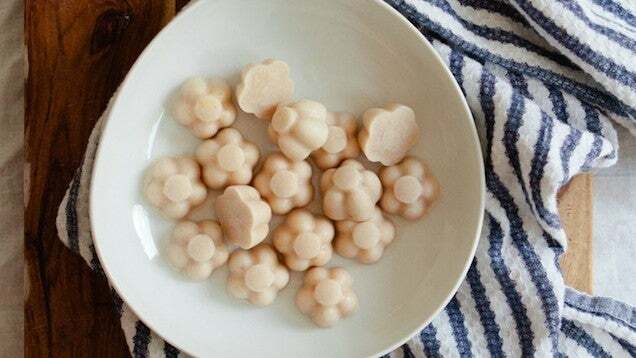 Freeze the treats for about five hours, then let your dog enjoy! Give your dog one or two to cool down during summer. Shouldn't be giving dogs too much dairy either, because in some it can cause quite an upset with their intestinal tract, causing gas, diarrhoea or even vomiting. Be better off with substituting the dairy for coconut milk. One I saw a few weeks back was coconut milk, fresh pineapple & fresh mango. Blend it up, freeze it in moulds & give to the dog when it's hot out. Been thinking about giving that one a go since mine love her ice cubes & mangoes..